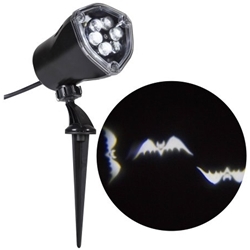 Includes one light show projection on a yard spike. Measures 12" long and 5" tall (not counting the spike). The chasing bats light show Halloween decoration creates the effect two bats flying up and down and two bats flying side to side. Plugs into a standard household AC outlet.